An impressive win in San Sebastian for FC Barcelona against Real Sociedad with Fran Sánchez’s team running out 5-2 winner in the 10th round of league matches. A brace for both Martens and Duggan and a goal from Aitana mean that Barça top the table with Atlético to play on Thursday against Rayo Vallecano. 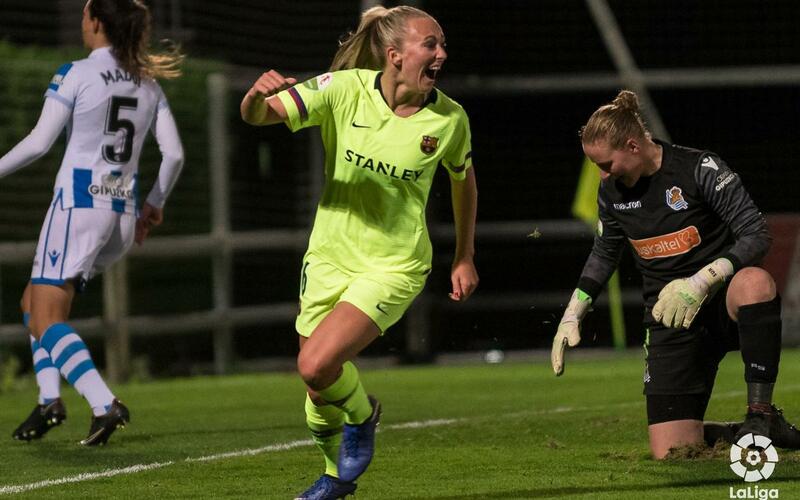 The game began in explosive fashion with Toni Duggan providing Lieke Martens with the chance to put Barça ahead which she took in style after just six minutes. However, barely four minutes later Bautista levelled things up only for Duggan to restore Barça’s lead after 12 minutes. With still less than 20 minutes gone, Martens scored again to make it 3-1 to the visitors. The madness was far from over and Duggan scored her second six minutes before the break to make the half time score 4-1 to Barça. Even though the blaugranes had lost Martens to injury late in the first half, Aitana kept up the pressure by grabbing a fifth just five minutes after the restart. Nahikari pulled one back for la Real but there was never a threat of a comeback for the Basque outfit. After the excellent away win in Donosti, the Barça Women’s team are back in action on Sunday in the Copa del Reina derby at home to Espanyol. Reial Societat: Quiñones, Maddi, Etxezarreta (Cardona, min. 46) , Nahikari, Itxaso (Olaizola, min. 88), N. Eizagirre (Chini, min. 83), L. Baños, C. Bautista (Palacios, min. 58), Soldevila, N. Mendoza and B. Beltrán. FC Barcelona: S. Paños, Marta Torrejón (Van der Gragt, min. 67), Mapi León, A. Pereira, Melanie (Leila, min. 57), Hamraoui (Patri, min. 72), Losada, Aitana, Alexia, Martens (Bárbara Latorre, min. 40) and Duggan. Goals: 0-1, Martens (min. 6), 1-1, Bautista (min. 10; 1-2, Duggan (min. 12); 1-3, Martens (min. 18); 1-4, Duggan (min. 39); 1-5, Aitana (min. 50) i 2-5, Nahikari (min. 59).